Last year’s Elevator Speech Contest winner, Lindsay Lammers from Colorado State University. Her video is here: https://vimeo.com/149089279. Can you top it? You’ve been dreading it. Everyone says that you need an Elevator Speech, right? Your advisor, your lab mates, they all say that you need a very short, very simple speech that explains what you do in the lab and why it’s important. Yet the idea of cramming the last few years of your research life and all your elegant data into a minute gives you a headache. Take a deep breath. And take advantage of an opportunity to learn the art and science of delivering a knock-out Elevator Speech in San Francisco this December. 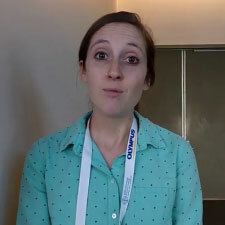 At ASCB 2016, you can learn the basics, practice with peers, film yourself on your smart phone, and enter the On-Site, All-Video, Mostly-Selfies, 60-Second Elevator Speech Contest run by the ASCB’s Public Information and Public Policy Committees. The contest winner gets a snazzy prize, but win or lose you’ll break the ice on the essential business of taking your science to the world. The premise is simple: The elevator door closes and you’ve got a trapped audience—a U.S. Senator, your dean, or Drake. Go for it! Sell your science in 60 seconds. The first step in San Francisco is the Public Policy Committee’s Advocacy Toolbox Workshop on Monday, December 5, 10:00 am. There you’ll learn (and practice) the essentials of elevator talking. Then to enter the Elevator Speech Contest, take a video of yourself and upload it to YouTube or Vimeo. Then go to www.ascb.org/elevatorspeech and fill out the form with the link to your uploaded video. Don’t have the means to record your video in San Francisco? Come to the ASCB Booth in the ASCB Learning Center on Tuesday, December 6, 10:00 am–10:45 am. A camera awaits you. All entries must be in by Tuesday at 11:00 am. The winner and runners-up will be shown at PIC’s 2016 Celldance Video and Elevator Speech Awards Tuesday at 12:00 in the Career Center Theater inside the ASCB Learning Center.